We receive many enquiries from organisations that need to develop products in compliance with international safety standard IEC 61508 (‘SIL 2’). As an example of the type of design solution that we use in such products, we explore the development of an industrial monitoring system on this page. 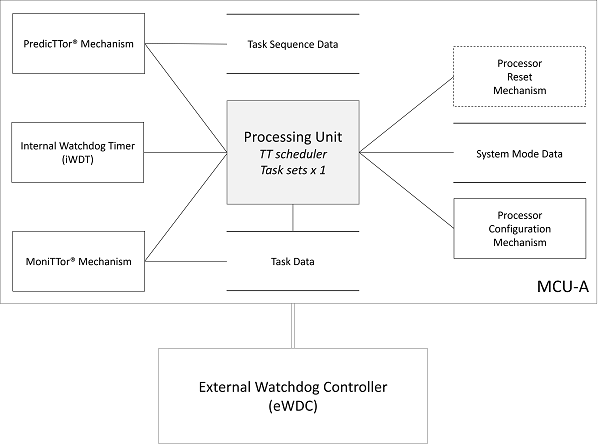 Our solution is based on a ‘Time Triggered‘ (TT) software architecture running on a single (low cost) microcontroller. IEC 61508 is concerned with functional safety, achieved by means of systems that are implemented primarily in electrical and/or electronic and/or programmable electronic technologies (for example, using microcontrollers – MCUs – and appropriate software). limited use of interrupts – a defining characteristic of TT designs – is “Recommended” for SIL1 and SIL2 systems and “Highly Recommended” for SIL3 and SIL4 systems. 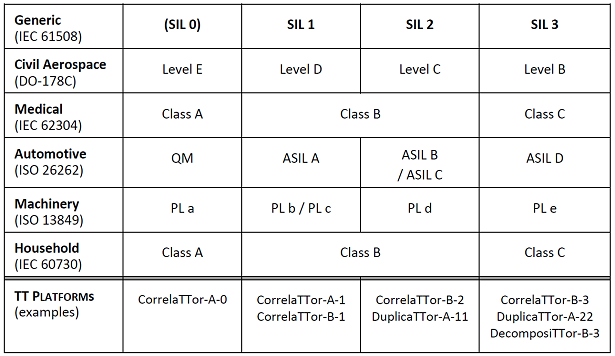 [IEC 61508-3 (2010), Table B.1]. 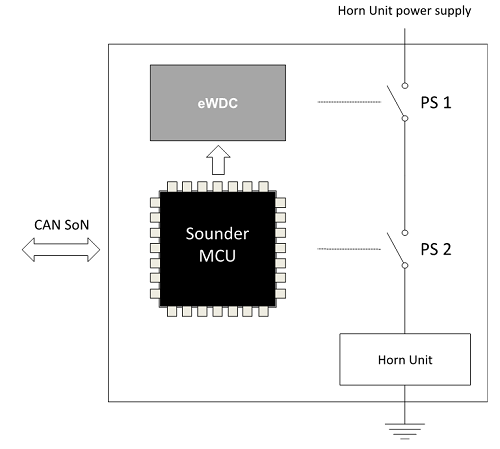 In this example, we will consider the development of a sounder unit (we’ll simply refer to it as the “Sounder”) for use as part of an industrial monitoring system (IMS). The unit is to be used to sound an alarm if a fire, gas leak or another potential hazard is detected by the IMS. 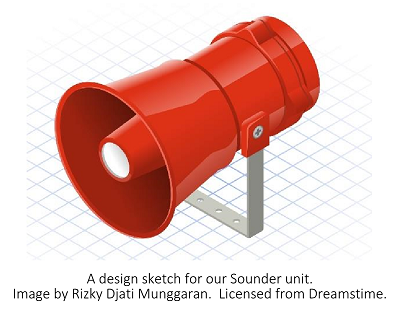 In this study we are concerned only with the Sounder unit. There are likely to be a number of Sounder units in each IMS. 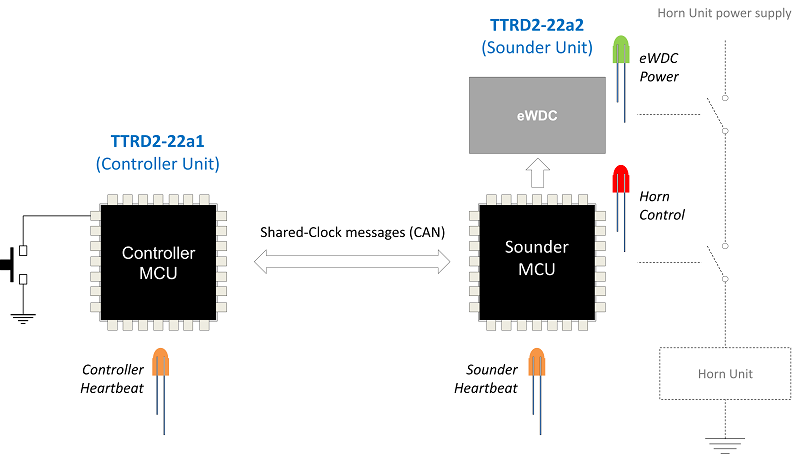 Each Sounder unit will (we assume) be connected to a dedicated CAN bus. We assume that the system will be required to have an operational life of 20 years. We assume that the unit will be replaced (or repaired) within 8 hours of a fault being detected. Early in the development cycle for any safety-related embedded system, we need to consider potential threats and hazards. This will include an assessment of the risks posed to users of the system or to those in the vicinity. The role of our system design process is then to include mechanisms in our design that will reduce such risks to an acceptable level. For the Sounder, the key risk is that the alarm will not activate when it is required to do so. This could result in people being exposed to dangerous gases, fires, chemical leaks or other threats that the IMS has been designed to detect. A secondary risk is that the alarm will sound when it is not required to do so. This may appear to be a ‘nuisance event’, but this would probably underestimate the risk involved. If, for example, the Sounder is triggered erroneously (even) once a month, this would not simply damage the reputation of the manufacturer of the unit, it would very likely to increase the probability that real alarm events would be ignored. Various ‘TT platforms’ are described in the ‘ERES2‘ book: use of one of these platforms can help to simplify the process of achieving compliance with various different safety standards. A summary of the recommended TT platforms is given in the table below. As we have noted, this is to be a ‘SIL 2 design’, in compliance with IEC 61508. Two design options from the above table would therefore be DuplicaTTor-A-11 or CorrelaTTor-B-2. Choices between different platform options may depend on a number of factors. For the purposes of this example, we will assume that the development team opts for ‘CorrelaTTor-B-2’ as their candidate platform, since: [i] they require a simple ‘fail safe’ design; [ii] the CorrelaTTor design is likely to result in lower unit costs than the DuplicaTTor alternative. The architecture of the chosen platform platform is illustrated schematically in the figure below. We’ve created a simple code framework to illustrate this example. You will be able to download this example from our TTRD page shortly. A short video related to this design example is available. The design example presented on this page is based on a SafeTTy Solutions™ Package (SSP-RTL2). SafeTTy Solutions Packages are designed to help your development team produce a safety-related embedded system quickly and cost-effectively, in compliance with one or more international safety standards (such as IEC 61508). SafeTTy Solutions Packages are based on TT designs and include carefully-selected combinations of our various products and services. SafeTTy Solutions Packages include an appropriate ReliabiliTTy® Technology Licence.